Halloween is the perfect time of year to embrace your inner prince, princess, superhero, warrior, or anything else you can dream of. As one of the best ways to completely transform your look, adding false teeth or wearing black wax over them may sound like a great thing to do, but you may be causing your teeth more harm than good. Watch out for these things listed below. 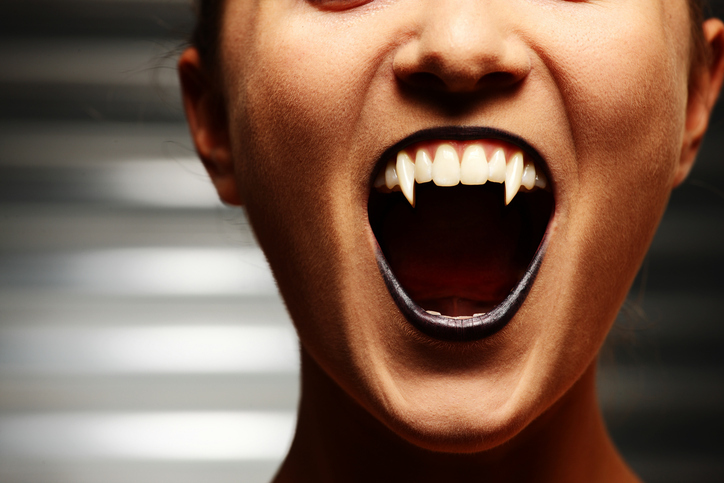 False teeth like vampire fangs or giant, misaligned teeth can be found at virtually any Halloween store or even a dollar store. And although these teeth may take your costume from A to Scary before you know it, they may be causing more harm than good. Because false costume teeth aren’t professionally molded to your mouth, they may hit your gums and cause them to bleed, or they may make your jaw uncomfortable. If you have to wear a pair of false costume teeth to complete your ensemble, try to take them out every so often to give your teeth, gums, and jaw a much-needed break. When you were a child, you may have grabbed an over-the-counter black wax or even a black crayon to color your teeth. And although these tools can make you look like you have a mouth full of missing teeth, some waxes may stain your teeth in the process. Virtually anything dark in color, even coffee or spaghetti sauce, can stain your teeth which make putting black wax on your teeth an even greater risk. Additionally, young kids, in particular, are notorious for swallowing anything put in their mouth— black wax included. Rethink your spooky smile this year by avoiding the mistakes listed above. To learn more about how you can take better care of your teeth, contact Dr. David Sorensen at Blue Water Dental of St. John’s.